I saw this on Facebook the other day and I thought some of you might like it. 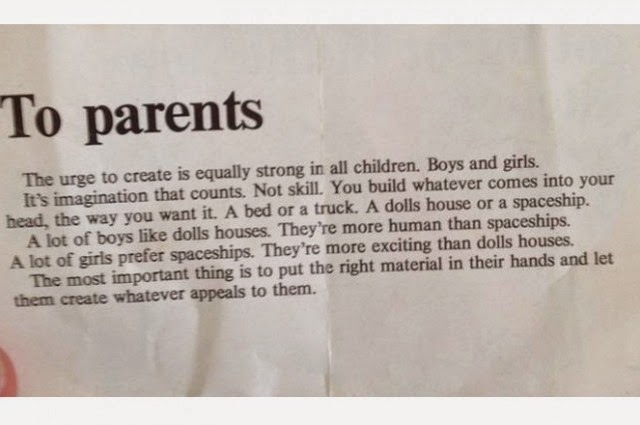 It's the instructions for parents for lego from 1973. It's imagination that counts. We use to make mud pies "sloppy daw, daw" and fill milk bottles with sand and empty them out. Sometimes we could go in the Wendy House. Never liked dolls houses, though! My was full of sticks. Sticks as swords, sticks as guns, just sticks to hurt my brother with really! You send the dolls into space! hmm I always found the best parenting trick was duct tape and a larger tree. Place old nylon stockings between the duct tape and the skin so there aren't any marks. Keeps the kids quiet and under control/right where they should be for hours. Sounds a little too good. Now all I need is a tree big enough! I like the article! My girls love boxes. they paint them , play with them, destroy them! I help! Yeah ! Great advice! I have two daughters too and my sister has three boys. They used to share toys, with the boys loving playing with dolls (only one of my daughters enjoyed dolls) and all of them loving lego type toys. My elder daughter's favourite Christmas present was a Scalectrix (is that how you spell it?) and her daughter's was a toolbox and a pile of wood offcuts. It's frustrating that we gender assign really! My girls will have little clue of it until they go to school I guess as I'm the one who cooks and cleans and stays home! Absolutely excellent advice. And we learn so much from doing ourselves, no matter what our age. Mine love building and I can see they love to copy me, so hopefully there will be a couple of young girls that like to build, grow, cook everything they can!